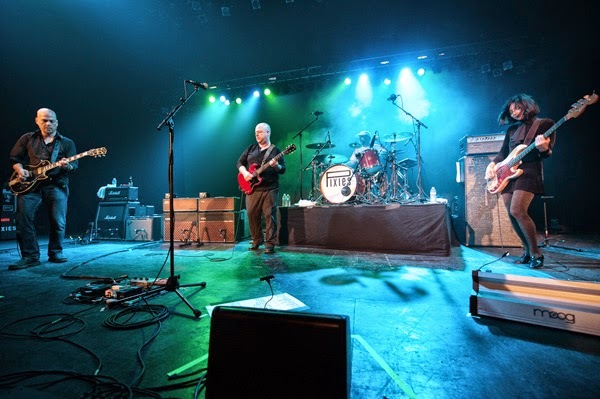 LOS ANGELES, CA (Wednesday, March 25, 2015) -- As part of the final leg of their 2013-2015 global tour, Pixies will join Robert Plant for a handful of shows, and the band - all big Robert Plant (and Zeppelin) fans - jumped at the chance when the offer was made. "No one sounds like Robert Plant, his voice is completely unique and instantly recognizable," said Pixies' David Lovering. "I've had all of his solo albums on my iPod over the years - 'Pictures at Eleven,' 'In the Mood,' 'Little by Little,' it doesn't matter what he sings, Zeppelin songs, solo songs, he's wonderful to hear, and I'm really looking forward to being on tour with him." According to band guitarist Joey Santiago, Plant and Zeppelin figured into Pixies' early history in a strange sort of way. "On one of our first tours, when it was just the four of us in a van, we had this cassette tape that had a lot of different songs on it, but for some reason, the only song it ever played was Zeppelin's 'When The Levee Breaks.' We'd fast forward the tape, rewind it, but whenever we pushed PLAY, it played 'When The Levee Breaks.' Weird." "We've never played with Robert Plant before," added Lovering, "but we actually met him on a flight from London once. Our manager and I started talking with him about soccer, talked and talked and talked about it, as the plane was landing, while we were walking through the airport to baggage, the conversation never stopped. He was a wonderful guy, no pretentions, just a real joy. We found out later that our manager had told him we were the Pixies, and he just said, "Boston's finest." Prior to joining up with Plant, Pixies will perform a series of major festivals as well as headline shows at intimate theatres in many cities not played on this two-year trek. The tour will also set the stage for the debut of some brand-new Pixies songs, written and arranged just in the past few months. Pixies' first new studio album in more than two decades, Indie Cindy [PIAS], was released April 29, 2014.